The Guitar Column: Keeley Phaser Set To Stun! Long known for their custom modded hi-fidelity guitar effects pedals, Keeley Electronics has just launched the first Keeley Phaser. In addition to its extremely lush sounding 6-stage analog phasing circuit, the Keeley Phaser also packs in Tap Tempo and a Ramp control to more closely simulate an actual Leslie speaker. According the the Keeley website, while the phaser's signal path is purely analog, Tap Tempo and Ramp are controlled by "digital circuitry to feel like an 'Invisible Hand' turning the knobs". Spooky. While Tap Tempo mode enables hands-free, on the fly changes to the basic Rate speed of the effect, it is in Ramp mode that the Keeley Phaser really shines. When the miniswitch is set to Ramp mode, the dialed-in Slow Rate speed makes a gradual transition to the selected Fast Rate speed. The speed of this transition depends on the setting of the R amp knob -- the slower the Ramp knob is set, the slower the transition from the Slow to Fast Rate speeds, and vice versa. 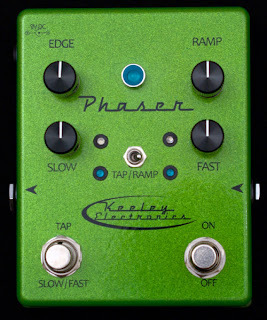 The Keeley Phaser's Ramp mode was designed to emulate the mechanical rotation of the classic Leslie speaker as it gradually speeds up and slows down, and this unique feature really makes the Keeley Phaser stand out from the pack.